Our haunts say things about us: what we care about, what we value, what type of person we are. Sometimes, we want people to know certain stuff about us, and we decorate our spaces for specific effect. And sometimes, if we're not careful about our personal spaces, they can say more about us than we would willingly, openly divulge. Insecurities. Secret lives. Shortcomings. Hardships. It's all stuff that I might be able to glean if I could freely go through another person's house, but that's not exactly an "opportunity" many of us are afforded. Kind of an invasion of privacy and all; too personal. Gone Home, an experimental exploration game by The Fullbright Company, is all about the intimacy of diving into someone's personal space. Although many games try their hand (and fail at) at environmental storytelling, Gone Home is different in that there's an actual non-creepy reason why you'd want to dig through a home (technically your home)—you play as a young woman named Katie who returns home after going overseas. One problem: you return to an empty house, and there's a most ominous note on the front door warning you not to look for your kid sister, Sam. Nevermind that a note like that has the same effect as leaving a diary out in the open with a giant DON'T READ scribbled on the cover. You haven't seen your family in forever, there's a storm outside, and the house is empty. Did something happen? Why such a dramatic note? You'll find yourself trekking deeper and deeper into a mansion-sized house to find out, often stopping to scrutinizing items and your environment. The empty house provides a clever way to build up mystery and intrigue, all while giving the player an easy way to become acquainted with their own family. You may not play through segments where you actually grew up with the people who live in that house, but thanks to the masterful way things are arranged as well as the game's willingness to let you pick items up and manipulate them, you almost feel like you did. Trophies and awards adorning the walls let you know you were always the studious, well-adjusted child. Exploring your parents' bedroom gives you a glimpse at their personal lives—marital problems, favorite books, old dreams. It's not until after you finish the game that you kind of wonder why anyone would leave so much revealing stuff out, but then again...well, personally, you wouldn't have to dig very far into my room to find things I would rather you not see. In any case, while that stuff is important, the real star of the story is your sister Sam. The last couple of years have seen a number of high-profile games with women or girls anchoring the lives violent men. Although much is said about the importance of these women, in the end, the stories aren't actually about them. Gone Home is not like that, thankfully. At its heart, the game isn't about you, either: it's the story of a girl growing up in the 90s. She likes Kurt Cobain, dyes her hair, plays Street Fighter, and writes all sorts of stories. If you are the exemplary child, she's more of the black sheep. As you explore, you hear audio diaries from Sam, seemingly written just for you. Given that she seems to always keep you in mind, you figure you must've been close...but then you left. You get the sense that you left home at a particularly confusing time for Sam, which was probably especially difficult for her given her lack of friends and unfair parents. It's hard to keep your heart from aching as you as you hear about her struggles and difficulties navigating being a not-straight teenager without her big sister to listen to her and understand her. The personal ache I felt is partially due to the knowledge that I've been waiting so long for a game to feature someone like Sam—a game that was about someone that's similar to me in a non-abstract way. Me! My background makes me a most unmarketable demographic (or so I am told). It feels embarrassing to say, but I could cry—did cry—with the relief of knowing a game like this even exists. 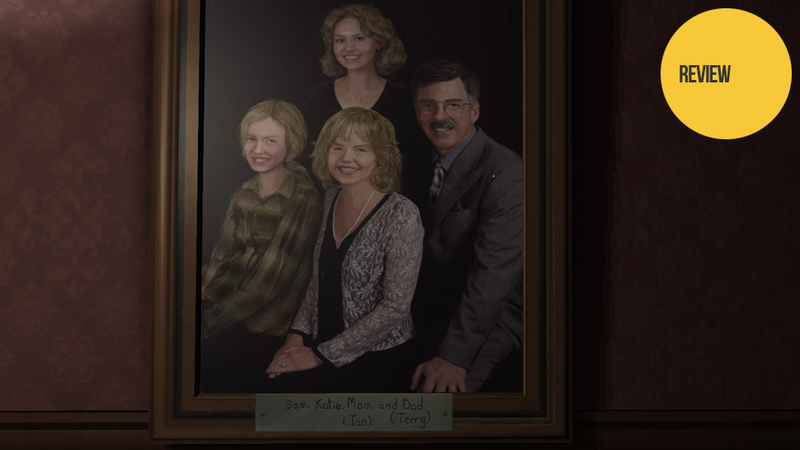 Between the superbly written Sam and the focus on quiet, contemplative exploration, everything about Gone Home makes you wonder how the game can exist in a market that doesn't seem to value the same things as it does—there's no explosions or shooting, no adrenaline-pumping excitement, no gritty story of unlikely heroes. Just you, a house and its (still living) ghosts. Better yet, it's the type of game that makes you wonder why it's taken so long for games like this—games this personal and human—to be made and come to our attention. It's happening more and more in recent years, to be sure. Part of the ache I felt while playing also came from being an older sister myself. Sometimes, what I felt was pride or amusement at her antics; she's a swell kid. And sometimes, I couldn't help but feel a little helpless thinking that I should have been there for Sam, or to worry endlessly about what actually happened to your missing sister in the game. You'll worry, too. Real-life siblings or not, Fullbright does this clever thing where the house doesn't just seem abandoned, it also seems like something terrible has happened. And you'll feel that. Sam has a thing for the paranormal, meaning the house is littered with stuff about aliens, ancient rituals, and objects that are supposed to let you speak with the dead. I found myself constantly dashing for the light switch whenever I entered a new room, and eventually got so paranoid I was convinced I saw shadows moving in the corner of my eyes. I doubt the game actually features those types of tricks, but that's just the type of rich atmosphere the game cultivates. It makes you believe in everything it shows you. To be clear—and this isn't a spoiler; the developers made this clear to me months ago, before I even touched the game—there is no big reveal, no big twist when it comes to 'what happened.' You will wait for it the entire game, because that's how games are, that's what games like to do. To a certain extent Gone Home plays into those expectations, even though it's entirely a game about ordinary lives. I've walked away stunned at how hard most games work to tell us touching stories while placing us in epic situations with unrealistic struggles (zombies! dragons!) when the reality is that our everyday lives can hold more nuanced difficulties and drama than a thousand BioShocks ever could. Isn't that why we need things like games to escape to, after all?